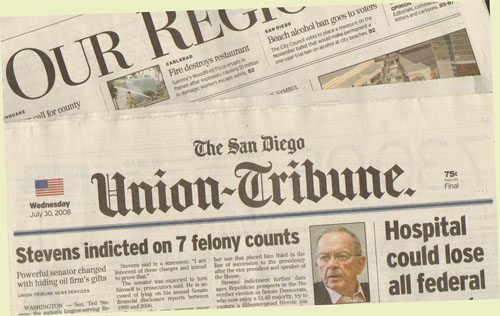 How Will Sale of Union-Tribune Affect San Diego? SEE UPDATE ABOUT POSSIBLE SALE OF U-T TO MCKINNON, KUSI OWNER. GO HERE. SAN DIEGO, CA. Oh, my god! The Union-Tribune is about to be sold – or at least – is up for sale. What will San Diego do now? Do we care? What does it mean for a one-paper town like San Diego to have its monopoly print media exchange owners … or even close down altogether? Ever since I was an enlightened college student at UCSD in the late sixties, I have hated the Copley Press – the parent company of the Union-Tribune. Being part of the campus anti-Vietnam war movement, we all knew the San Diego Union and its sibling the Evening Tribune to be a key component in the establishment’s armour here in San Diego. The papers supported California Governor Ronald Reagan in his harsh dealings with student protesters during the years 1968-70; James Copley – then owner- had backed and encouraged Richard Nixon from his early days, and stood by his side while Nixon was expanding the war, ignoring dissent against the war, through Watergate. The news monopoly supported the war in Southeast Asia, supported C. Arnholt Smith – a major bigwig banker and power broker who eventually fell from grace and landed convicted and imprisoned for banking fraud; it backed other members of the local power elite in their public land give-aways and development dealings. In essence, the paper was a Republican Party propaganda organ. On the flip side, the papers despised antiwar protesters, hippies, trade unionists, feminists, Blacks and Mexican-Americans, and other minorities. The slant of their news articles and the strong tenor of their editorials clearly placed the Copley Press as the Guardian of the White, Rich & Powerful here in Paradise. So, when just last week on the 24th, the Copley Press announced that the San Diego Union-Tribune was being put up for sale, I had more of a flush of emotions than a raised eyebrow. Many people in and outside the information business have known that major newspapers in this country were in bad times, with falling advertising and falling subscriptions – thanks to the internet, newspapers were tightening their belts, laying off employees, cutting back on coverage and reviews, recalling their stringers. And we knew that our local mainstream media giant was in trouble, thinning down, buying out workers, cutting back on just about everything. So, hearing the news that the Union-Tribune was on the auction block was of no great surprise. But the questions came flooding in: who was going to buy the paper? who could buy it? would the paper change its editorial bias? why was it really for sale? Pressed by newspaper industry woes and plummeting real estate advertising, the parent company of the San Diego Union-Tribune said Thursday that it may put itself up for sale. Copley Press Inc., which also owns the biweekly Borrego Sun in Borrego Springs, Calif., said it hired New York’s Evercore Partners to explore possible deals, including a sale. The outlook has been bleak throughout the newspaper industry, as the weak economy and an exodus of advertisers to the Internet have cut into profits, accompanied by declines in readership and sales. Over the last week, a host of newspaper publishers have announced lower profits and double-digit declines in ad revenue. The LA Times article went on to say that “the move by privately owned Copley Press was a surprise to many observers because the publisher had been selling off other assets to provide a financial cushion for its flagship newspaper.” It was a surprise to only those who weren’t paying attention. Those at the LA Times probably snickered when they published this story, for during the late seventies and early eighties, the Times had their own San Diego edition competing with the Union. And now their old nemesis was being sold. But what about the rest of us, the rest of us resident-citizens of the 7th largest city in the nation, of the 17th largest market area, what happens to us when the only daily newspaper in the county goes out to bid? How does it affect us? Who would buy the paper? The various publicly owned newspaper empires in California appear to not be in the buying mood. A private group of investors could borrow money to buy the paper and then sell it in a few years after returning it to healthy profitability. This approach, similar to “flipping” a house, isn’t unusual in the business world. But anyone making such a purchase would hope to make a tidy profit in the long run, and that may be difficult. “It’s a tough time, particularly for larger newspapers,” said newspaper consultant John Morton of Morton Research Inc.
Dotinga thought the pending sale of Copley’s flagship newspaper was a sign of desperation. What with the fact that the Union-Tribune is the nation’s 21st-largest daily newspaper, with a circulation of more than 300,000 on weekdays and more than 350,000 on Sundays, the newspaper claims, its sale does seem inconsistent with management’s maneuvering to keep above the red line. Over the last couple of years, David C. Copley, the current president and CEO, has been selling company newspapers in California and the mid-West. In March-April 2007, Copley Press sold 9 newspapers in Illinois and Ohio. The paper has laid off dozens of staff over the last two years. A couple of months ago, in May, the company sold the Copley news service, and since then, publicly announced that it intends to sell La Casa del Zorro, a Borrego Springs resort it has owned for 50 years. But, get this: in the last five plus years, from 2002 to late 2007, the paper lost a little over 73,000 paid subscribers – 20% (2002 average was 361,776; for the previous six months up to April 1, 2008, the average was 288,669). As land values and business equities crumbled, (John D.) bought cheap, like Horton in the 1860s. His acquisition of the Union in 1890, and the Tribune a decade later, gave him the loudest voice in town – the better to publicize the reservoirs that his Southern California Mountain Water Company was building to rescue San Diego from the severe drought of the early 1892. In 1891 he purchased the local horse-drawn trolley franchise and converted it to electricity (generated, of course, by Spreckels’s coal). 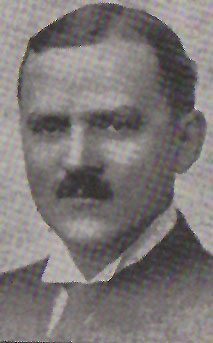 His San Diego Electric Railroad … would define the main axes of urban growth in the early twentieth century as it built a network of lines across San Diego Mesa (today’s “Midcity”). Many of the resulting mesa-top subdivisions from Hillcrest to East San Diego would be financed by the Spreckels-controlled First Trust & Savings Bank. Likewise, John D., by buying up the entire south side of Broadway … from Sixth Avenue to the waterfront, pivoted the axis of downtown commerce from Fifth Avenue to Broadway, whose beaux arts skyline would consist principally of Spreckels’s properties: the ornate Spreckels Threatre, the San Diego Hotel, the Union Building, and the commanding Spreckels Building. Spreckels, an absentee landlord – he continued to live in San Francisco until the earthquake in 1906 – “owned nearly everything of value in San Diego,” an adversary once complained, and had acquired so much real estate that he paid ten percent of the County’s property tax assessment. Spreckels wielded his papers like a whip, snapping the city council into line, fighting off post-recession revolts and power struggles among the elite. He aligned himself with some of the most reactionary, corporate, and anti-labor forces in the country – such as E.H. Harriman, the huge railroad magnate, and Gray Otis and Harry Chandler – who owned the Los Angeles Times. At the time, there was open class warfare raging in Los Angeles, and Otis and Chandler had the city pass the harshest antipicketing ordinance in the country, forcing the jailing of hundreds of trade unionists. In retaliation, the LA Times building was bombed. … sparked months long struggle by Industrial Workers of the World (IWW) organizers and supporters. Hundreds of people were jailed, beaten; fire hoses were turned full-blast onto peaceful crowds including old men, women and children. The brutality of the city’s actions against the free speech fighters caused sympathy for them throughout the nation and world, with many people coming to town to demonstrate solidarity, including Emma Goldman, the famous labor orator and author. The San Diego Tribune, for example, called editorially, for the free-speech prisoners to be shot or hung. The Union and Tribune both called for violence against the labor activists, the Wobblies and their supporters (“hanging is too good”). For nearly a year, San Diego’s downtown streets were ruled by a business-backed vigilantes, and it was broadly speculated that Spreckels was the leader of the vigilantes. Some of the ringleaders were clearly his men, including a Union reporter. Thus was the type of man that ran the publishing empire that spawned the Union-Tribune. Spreckels died in 1926, and his holdings were sold off. Enter Colonel Ira Copley, a Mid-Western newspaperman, a former Republican congressman, with small empires of newspapers and power utilities in Illinois. (Copley was a colonel because he led some Illinois militia against Pullman strikers.) Copley bought both the Union and Tribune, and made the Union the flagship of his newspaper flotilla. He had been a supporter and close ally of Herbert Hoover. Thus was born the Copley Press Empire, that Potter documents. 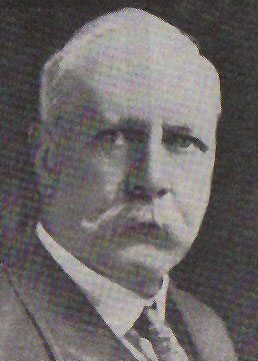 Ira Copley quickly consolidated his power over the city and its politics, buying out and then closing down a rival newspaper, the Independent. Like the Spreckels family before him, Copley gained a stranglehold over the city’s media and never let go, forging a profitable alliance with landowners and developers. Copley and his newspapers became the oxygen that the town’s businesses needed to breathe; without his say-so, they would suffocate. When Upton Sinclair, the progressive author, ran for governor of California in 1934 on a platform of “End Poverty in California,” Ira went after him. During the Democratic primary Sinclair won San Diego County by 3000 votes; after Copley was finished raging against him with his broadsheets, Sinclair lost the County by 10,000, as Potter instructs. Such was the man Ira Copley. A few years later, Copley successfully went after the Sun, a left-leaning evening paper, published by E.W. Scripps, a wealthy muckraker. But Scripps died and Copley bought it in 1939 and folded it into his Tribune. A media monopoly in San Diego by the Copley family was finally accomplished when James Copley carried on the newspaper after Ira’s death in 1947 by out competing the Journal, and buying it in the early fifties. Because Potter documents how James Copley became instrumental in the political leanings and life of Richard Nixon, we don’t have to here. We can see how those who published the Union ran this town. Those of us who have lived through the James-Helen-David Copley reign over politics and social life here in Paradise don’t need to be reminded how conservative the city was at their molding. Now, the Copley Press is at an end, and we don’t know who will take it up, if at all. And we are reduced to observers and passerbys on the sidelines as the Big Money decide who will attempt to control our fate and wash our brains. lets pool our good looks and cash and maybe we can buy it. I’ll start saving my poker winnings. Yes, the U-T has long been seen as a third rate rag with yellow journalists who are terrible writers! And one comment I’ve been wanting to get out into the public for a while…the editorial page editor Bob Kittle–the key tool for the U-T’s outright rightwing Republican prejudice–is a questionable character. I lodged a complaint at the Mission Valley YMCA for his inappropriate behavior in the sauna. I wonder how the U-T’s rightwing community supporters would feel about the paper if they were to have witnessed Bob Kittle’s sauna-room improprieties!? I’ve had run-ins with Kittle at the Mission Valley YMCA for years now. He parks there at lunchtime and takes long, shirtless walks along Friars Road and along the SD river and stares down anyone crossing by. Too weird. Okay, let’s start a “Bob-Kittle-Watch” at the Mission Valley Y. Stu – you’re first, Doug take the 2nd shift, Donny the third, and OB Barfly- if you can get off your barstool, the fourth. I’ll take the midnight to 4 shift.